(The Quran, Surah al-Baqarah, 2:2O7). Suhayb ar-Rumi (ra) was among one of the few people in history to be honored with a Quranic revelation addressing his deeds. He was born to an Arab family but was known as ar-Rumi or The Roman. How did this come to be? His father was a governor and they lived in a palace on the banks of the Euphrates river. When he was five years old, his mother took him on a picnic to a nearby village. His family was enjoying the day, when the village was suddenly raided by Byzantine soldiers. Suhayb was taken prisoner and sold off into slavery at one of the Byzantine slave markets. He spent the next 20 years as a slave, being passed off from one owner to the next. He forgot his native Arabic, as the major language in the Byzantine empire was Greek. One day he saw an opportunity for escape, and rode to freedom to Mecca, which was a refuge at the time. His Arabic was laden with an accent, and he had blonde hair, so people took to calling him ar-Rumi or The Roman. In Mecca, he found himself in the position of representing a wealthy Meccan man in trade, and he himself became quite wealthy. One day upon returning from a journey, he heard news that Muhammad (pbuh) was preaching that there is only one God, encouraging people to be just and good, and refrain from shameful and evil deeds. Suhayb, who had grown up as a slave in the homes of the wealthy saw first hand the excesses and sins of the wealthy and privileged. He immediately took to this notion of justice. He went to visit prophet Muhammad (pbuh) at the house of al-Arqam in order to learn more. He was warned, rightfully so, that he was a stranger in Mecca, and had no family or clan to protect him- therefore, he must tread lightly. As he approached the home of al-Arqam, he was joined by another man, Ammar ibn Yasir. They both listened to what the Prophet (pbuh) had to say intently, and Allah (swt) opened their hearts to Islam. They stayed the day with the Prophet (pbuh) and left at night. Despite his care to maintain secrecy, the people of Quraysh found out about his conversion. As he had no one to protect him, he suffered immense physical and psychological punishment. When the Prophet (pbuh) and Abu Bakr (ra) were to migrate to Medina, Suhayb intended to go with them. This too was discovered by the people of Quraysh. Suhayb was quite rich, and they did not want him taking his wealth with him. He was watched by guards to ensure he did not leave. Still, he was not deterred from his intention to join the Prophet (pbuh). They replied that they would not let him leave with his wealth. Suhayb then asked them if they would let him continue on his way if he told them where to find his gold and silver. 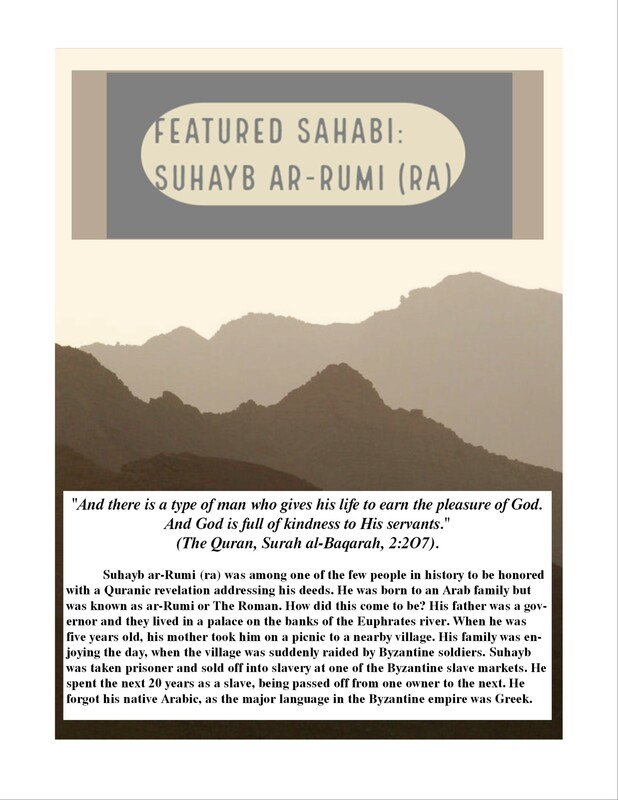 They agreed to this transaction – all of Suhayb’s money was given to Quraysh, and he was allowed to join the Prophet (pbuh). This was the event that was commemorated in the Quran (Surah al-Baqarah, 2:2O7). The Prophet (pbuh) was surrounded by incredibly strong, pious, and generous people who helped support Islam in its infancy. These people lived, fought and died to protect the message of the Oneness of Allah, and the Prophethood of Muhammad (pbuh). They should be remembered and honored as heroes who built the foundations of the culture and history of Islam. Suhayb ar-Rumi was one such man, may Allah grant him Paradise.